Nintendo NES Cart. published 29 years ago by GameTek, Inc. The exciting software version of television's number one game show has an all-new Family Edition! Now, everybody's favorite, Wheel of Fortune, has even more great fun: over 1000 challenging puzzles in both regular categories and new ones to give you even more great game play. You're the contestant competing against your friends or matching wits with the computer. You already know how to play... and it's your turn. Let the theme music inspire you and spin for a consonant or buy a vowel if you have the cash. If you're right, the pretty hostess will turn the letters. Do you want to take a shot at guessing the puzzle, or do you want to run up your score? 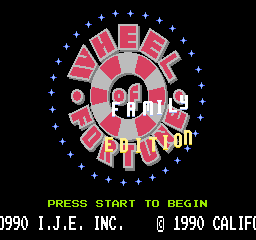 Get set to spin, get set to win - the Wheel of Fortune Family Edition is hours of fun for the whole family! Released in March 1990 in the USA.